On Monday October 12, 2015, MBAC partnered with Sharp Healthcare for the Sharp Rehabilitation Day on the Bay. This event provided an opportunity for persons with disabilities to participate in watersports activities they might not otherwise have access to. 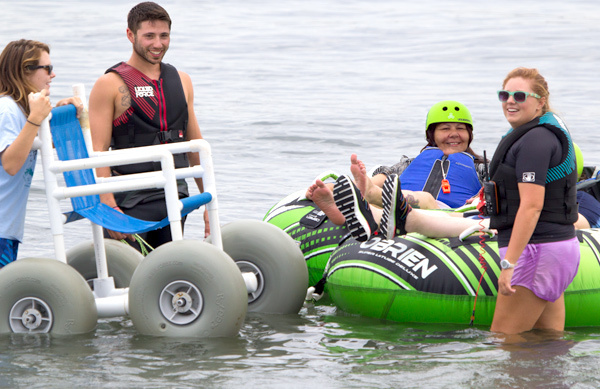 Adaptive waterskiing, kayaking, tubing and sailing were a few of the accessible activities offered to the over 75 participants with disabilities. MBAC provided specially designed/constructed equipment and highly trained staff to run the watersports activities. This equipment and expertise allowed for a variety of activities to be adapted to accommodate a wide range of disabilities, including but not limited to paralysis, stroke, brain injury and amputation. Day on the Bay provided a safe and fun environment for persons with disabilities to participate and learn different watersports activities. It is made possible through a grant provided by the Torrey Pines Kiwanis, using proceeds raised from the La Jolla Festival of the Arts. The event provides a rewarding experience for both the participants as well as the staff and volunteers. Many MBAC staff members proclaim the event to be their favorite work assignment of the year.